If you’ve recently decided to learn to play bass guitar, you should be proud of yourself. Music can change your life forever, and that’s no exaggeration. If you stick with it, you’ll never regret it. You’ll look back on this as one of the best decisions you’ve ever made. Choosing to learn bass is a particularly smart choice. It may seem like bassists often linger in the shadows while guitar players take the spotlight, but other musicians know the importance of a good bassist. People who know music see the role of the bass guitar as integral to the sound of the band. Bassists are also somewhat hard to come by. Guitar players grow on trees, but a really good bassist is a rarer thing. The point is, if you stick with it, and you are sure bass guitar is the instrument for you, you are going to have a lot of opportunities. Get really good at it and you might even make it a career. But first things first: You need a bass. 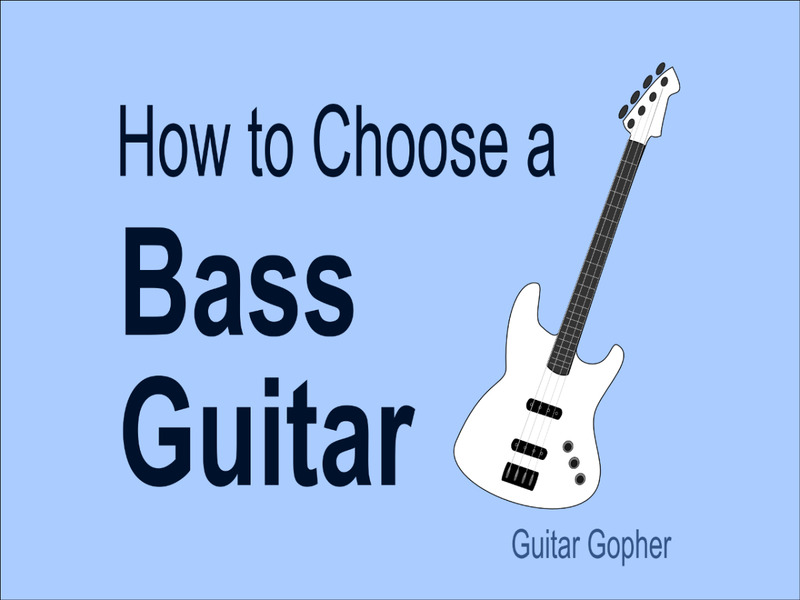 This bass guitar buying guide is intended to help new musicians choose their first instrument. The info presented here will help you learn more about the bass in general, so you can make the best decision possible. Deciding on a spending limit is always tough for new musicians. This goes for guitarists and drummers too, and I suppose any other instrument. You don’t want to drop a lot of cash, especially if you aren’t sure you’re going to stick with it. On the other hand, you don’t want a cheap bass. Poorly made instruments that are difficult to play just make the learning process harder, and it’s going to be tough enough already. I could just point you to my article on my top bass guitars for beginners, but the idea of this post is to teach you about some of the things I look at when evaluating a bass. I think you’ll find that around $200 is a good price point for a first instrument. Remember, you are going to need an amp too, so you don’t want to go much higher than that. As a beginner you need to walk the line between quality and affordability. But what if you aren’t a beginner, or if you have a little extra cash and you want to start out on something better? In that case, I’d look to bass guitars around $500 for a good mix of professional features and affordability. Of course you could spend a lot more, but as a beginner or intermediate player I really don’t think there is any need. My number-one rule for choosing a first instrument is to pick a bass guitar that inspires you. That’s because it takes a lot of time and effort to learn music, and the more excited you are about picking up your instrument and playing the more you’ll want to practice. You'll see electric basses in all different body styles. As a newbie it really doesn’t matter what you choose, as long as it is something you like. The only caution I’ll give is to make sure you go with an instrument you can comfortably sit down with while practicing. In most cases it is smart to leave the crazy shapes for when you get a little better. Alder: Bright with good midrange. Mahogany: Warm and deep with good low end. Used for guitar bodies. Basswood: Similar to mahogany but a little woodier and not as articulate. Maple: Used in necks and fingerboards. Crisp and bright. Rosewood: Used in fingerboards. Warmer than maple. If you are like most musicians, after you’ve been playing a while you’re going to care a lot about tonewoods, and probably have some pretty strong opinions. For now, don’t sweat it too much. 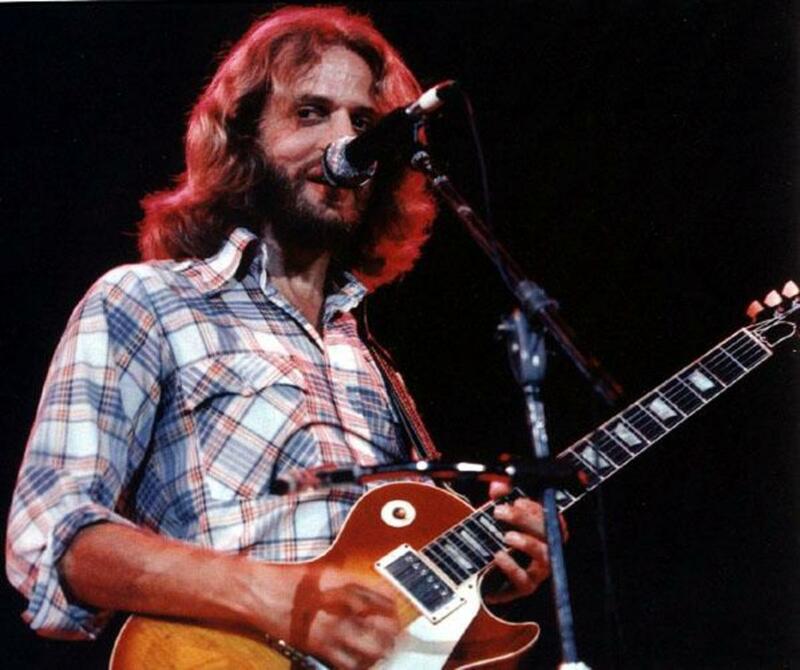 And, realize that guitar companies often take a few shortcuts with wood in their budget-level guitars. That’s okay, because it means we can get a solid instrument for a good price, even it is does utilize some lesser-known wood species such as Indian laurel or agathis. You can look up the definition of scale length if you like, but I’m a little concerned it would only confuse beginners to try to explain it here. What you do need to know is that most bass guitars today have a 34-inch scale length or, in the cases of extended range instruments, sometimes 35 or 36-inches. Technically, those are “long-scale basses”, but they’ve pretty much become the standard. These are big instruments, and this is one of the most daunting things for newbies when first learning to play. However, there are also “short-scale basses” that come in around the 30-inch mark. They are a little smaller, with frets that are closer together. For some beginners, especially those with smaller hands, they are more manageable. Be aware that short-scale basses also sound a little different. Scale length affects string vibration, and short scale basses tend to sound deeper and less articulate. The bottom line is this: Most new bassists should start out on a standard 34-inch bass. However, if you are a small player with small hands realize there are other options out there. 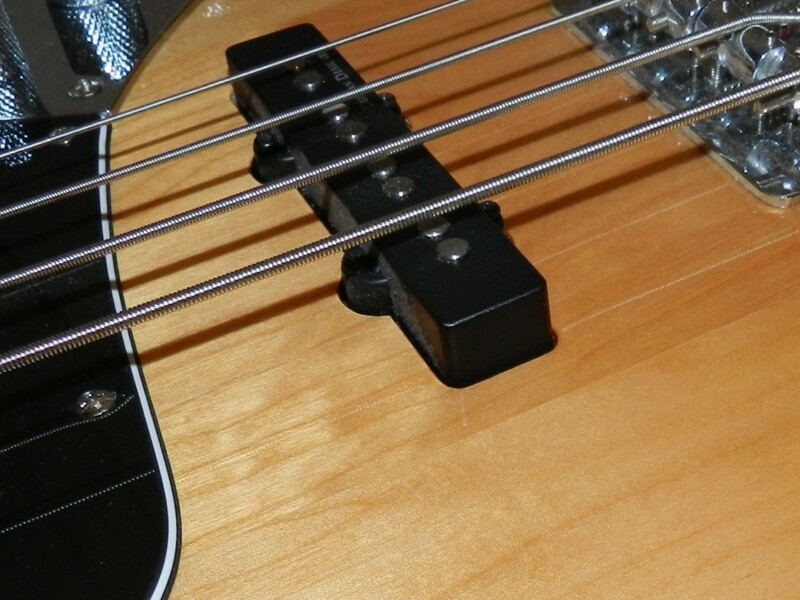 Bass guitar pickups are magnets wrapped in wire. They create a weak magnetic field, and when the bass string vibrates it disrupts that field, creating an electronic signal that’s transferred from the bass to the amp, where it’s processed and turned into a signal that the speaker relays as audible sound. As you can imagine, the technical explanation for how pickups work is quite a bit more elaborate, but that’s it in a nutshell. 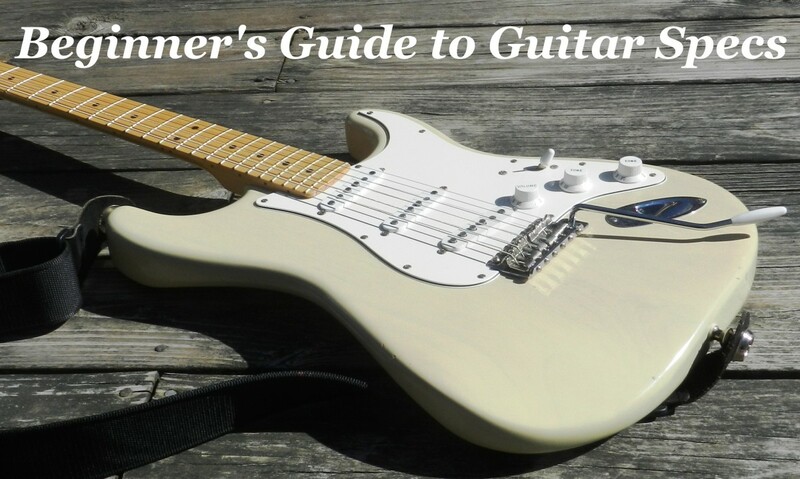 As a beginner this is good to know, but more importantly you need to know about the different types of pickups and how they influence your sound. Single-coil Pickups: These are thinner pickups, often with a visible single row of magnets. In general they have a clear sound, and they are widely used on many basses. 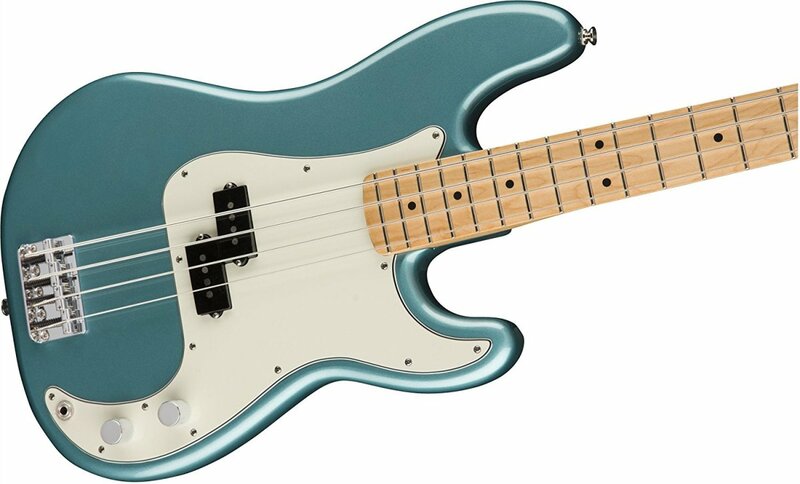 An example of a bass that uses single-coils well is the Fender Jazz Bass. Humbuckering Pickups: These are wider, fatter pickups often with two rows of magnets. They have a fatter, thicker sound and a nice growl. An example of a bass that utilizes humbuckers is the Ernie Ball Music Man StingRay. Split-coil Pickups: These are typically used in the middle or neck position, and they have a deep, round sound. A good example of a bass that uses a split-coil pickup is the Fender Precision Bass. Some basses have one pickup, and some two. Some have two single coils, while others have a two humbuckers, or a combination of a single coil, humbucker and/or split coil. As a beginner I think it is a good idea to start on a bass with two pickups, so you can experiment with different sounds and see what you like and don’t like. Once you become an intermediate player you can move on to a bass that has the types of pickups you think work best for your sound. If you are interested in learning more about different types of pickups in general you can check out my article on single coils vs. humbuckers. It's written for guitar, but many of the same ideas apply. If you’ve been looking at different basses online you’ve probably seen the terms passive and active for describing electronics. It is pretty simple. Passive basses work basically in the manner described above: Magnetic field, string vibration, signal sent to amp, processed and amplified. Active basses have an extra step in there. Before the signal is sent to the amp it goes through an onboard preamp, which typically has various controls for tone shaping. There might be a three-band EQ with controls for bass, middle and treble, or two controls for high and low cut/boost, or something much more elaborate. The idea is to give you a little more control over your tone right on the bass itself, and a strong signal to your amp. You can control tone at the amp as well of course, but an onboard EQ is easy to tweak during a song or set. Be aware that active electronics do require a battery to function, which is typically installed in a compartment on the back of the bass. To me, active basses sound more modern and versatile, where passive basses sound more organic and woody. I like active basses for metal and hard rock, and I prefer passive for rock, country or blues. For jazz I think either can be effective. It’s a personal choice, and you’ll form your own opinions over time. Four or Five-String Bass for Beginners? The standard bass guitar has four strings. Physical differences between the instruments aside, sonically these four strings are the same as the lowest four strings of a regular guitar, except an octave lower. This is one of the reasons it’s fairly easy to move between bass and guitar. The same theory you learn on one applies to the other. However, there are also 5-string bass guitars. These have an extra lower-pitched B string. The extra string makes playing chords and scales a little easier in the mid and lower registers, as you don’t need to change hand positions as often. Five-string basses are favored by many heavy metal bassists. The low-B comes in handy when playing alongside 7-string or detuned guitars. Should you choose a 5-string bass as a beginner? If you decide you need a five for playing the music you want to learn, and you are really convinced it’s the best choice for you, go for it. There are some good 5-string bass guitars for beginners, though they are slightly more expensive than fours. However, I do think the majority of newbies are better off starting with a 4-string. It just makes the learning process easier. It’s tough enough learning to play bass without having an extra string to figure out. That’s just my opinion. Remember: The most important thing is to choose an instrument that inspires you! There are a few basses I typically recommend to beginners. I think they are good places to start and will get the job done for most newbies. But remember these recommendations are based on my opinions and experiences over twenty plus years playing bass. In addition to my advice here, I encourage your to do your own research and draw your own conclusions. 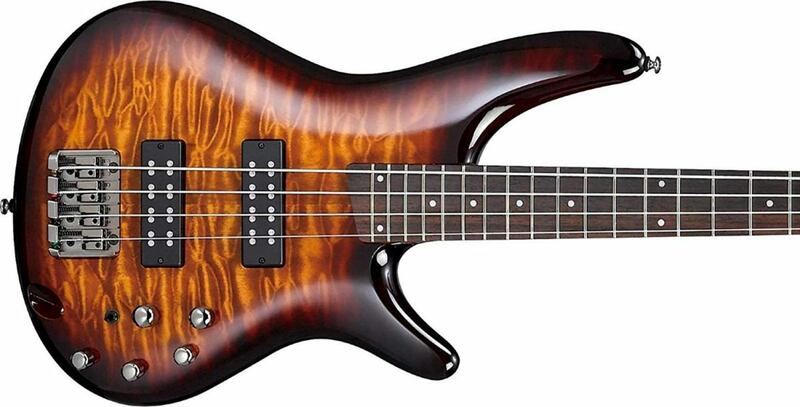 The first bass I recommend checking out is the Ibanez GSR200. I’m a big fan of Ibanez Soundgear basses, and I played both 4-string and 5-string versions in bands. The GSR200 is a beginner-level instrument that has a similar feel and sound as the pro-level Soundgear basses. On of my favorite things about Soundgear instruments is the powerful EQ section. The GSR200 is an active bass with a single-coil and split-coil pickup, controlled by two volume and two tone controls. The thin, comfortable necks are another thing I love about Soundgear basses, and the GSR200 comes through here as well. If you are into metal or jazz, or just want a powerful rock bass, the GSR200 is where I would start. 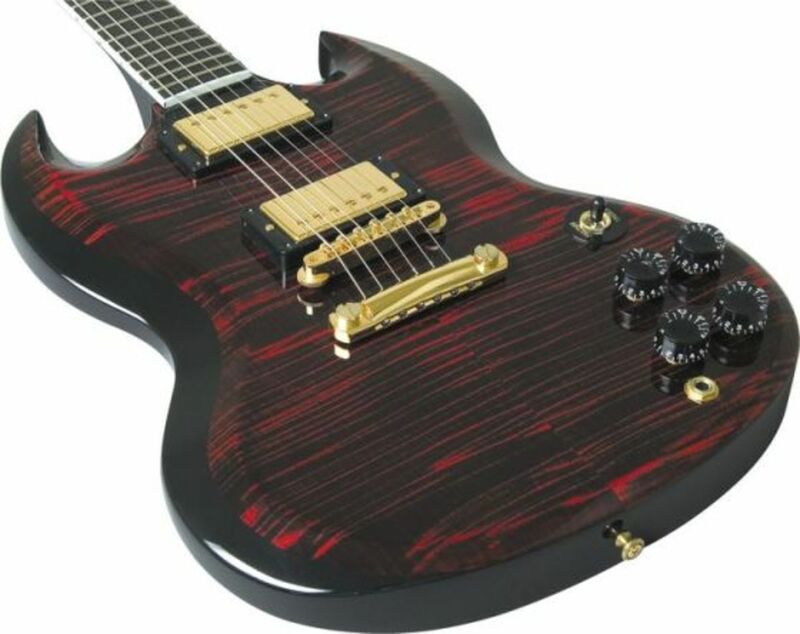 It also comes in a 5-string model, the GSR205. The other bass I recommend is the Squier Affinity PJ Bass. Squire is a brand owned by Fender, the company that brought the electric bass guitar to life back in the 1950s. 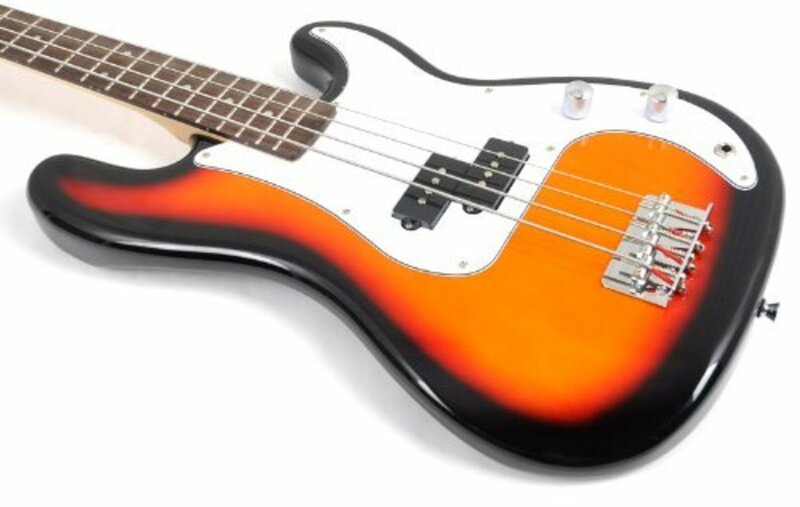 The Fender Precision (P) and Jazz (J) basses are two of the most popular guitars in history. Jazz basses are known for their smooth single-coil sound, where Precision basses are known for their punchy split-coil sound. The PJ bass give you the best of both worlds. This is a passive bass with one single-coil and one split-coil pickup, controlled by two volume knobs (one for each pickup) and one tone knob. The PJ Bass is a very basic instrument, but basic is what you want when first starting out. I like how it incorporates both Jazz and Precision-style pickups, giving newbies a chance to learn what they like (or maybe don’t like) about each sound. You’ve read this article, done some research and decided on a bass you think will meet your needs. Now what? I always advise going to a few music stores and checking instruments out in person. If you are new and have no idea how to play a note you can ask a store employee to demo the instrument. We were all new players once, and they know how you feel. There are a few advantages to buying from a brick-and-mortar store. You’ll walk out with an instrument you’ve physically inspected, and returning it is super easy if necessary. Most importantly, you’ll begin to establish a relationship with the store. The downside is that instruments are often on the wall for weeks or even years before you buy them, but that really depends on the store. Stores also stock a limited number of instruments, and they may not have exactly what you want. 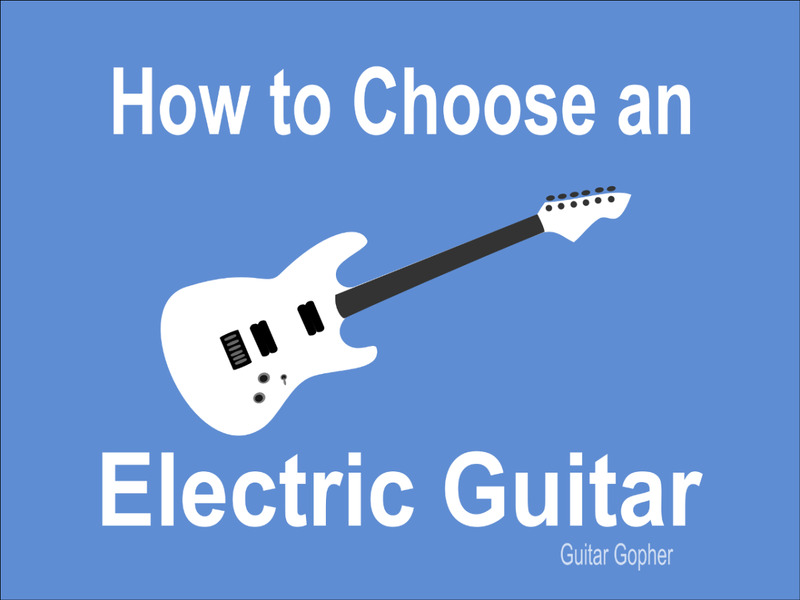 Should you buy a guitar online? When you buy through a site like Amazon, Sweetwater or Musician’s Friend you have a better chance of getting exactly what you want, and you know your new instrument hasn’t been handled by dozens of teenagers before you got it. The downside is that, even though most places have very good return policies, it can be a bit of hassle to send things back. The choice is yours. Personally, I do both. If I can find a guitar or bass I love I won’t hesitate to buy from a store. Otherwise, I’ll look online. 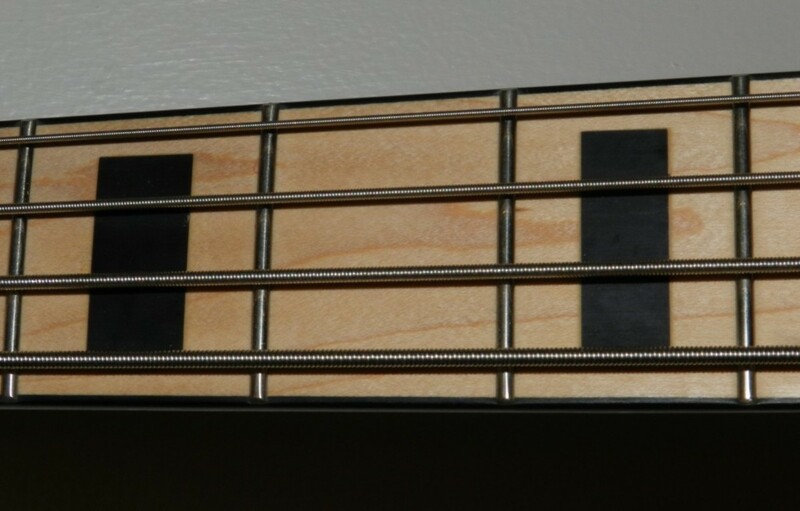 I hope this article helped you in your quest to choose a new bass guitar as a beginner. Good luck, and don’t forget that this is all supposed to be fun! Don't forgetabout Ibanez basses. Some really nice and affordable models to be tried.